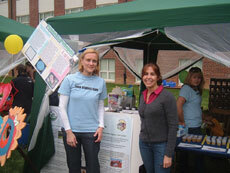 The Food Science club participates in Ag Day- the College of Agriculture and Natural Resources annual community event. Food Science faculty are committed to helping students of all ages succeed and develop a passion for science. They assist with career days and CANR events, judge local science fairs, mentor students, and participate in university-wide events for students. The Food Science Program’s faculty and students conduct regular outreach activities in an effort to reach potential students and educate about food safety. UD food scientists share resources and curriculum with schools in Delaware, New Jersey, Pennsylvania, and Maryland through classroom visits, direct mailings and the internet. UD hosts hands-on teacher workshops that introduce food science laboratory activities which are immediately ready for implementation in the classroom. Curriculum is developed in-house and is also obtained through the Institute of Food Technologists. Currently, food science faculty is working with teachers to develop a new high school food science curriculum that includes aspects of food safety. The Food Science program, in conjunction with the college’s Academic Programs office, offers a food science exploration program for high school seniors. Students must apply to the program and receive a recommendation from their teachers. The full day program includes hands-on activities and interaction with food science faculty, students, and professionals. High school students at the Governor’s School for Excellence work with food science faculty to learn about foodborne outbreaks. Students combine the principles of epidemiology, microbiology, and forensic science, similar to UD students taking the “Foodborne Diseases-Investigating Outbreaks” course.